Take a closer look at NewerTech's GripStand and GripBase. Get a grip on your iPad display needs. 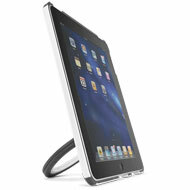 The NewerTech® NuGuard® GripStand® is like a multipurpose tool for your Apple® iPad®. 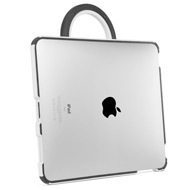 The hard plastic protective shell grips your iPad snugly while enveloping it in a shock-absorbing inner rubber liner. The removable, skid resistant desktop stand can be swiveled 360° and positioned at virtually any angle for viewing or typing needs. 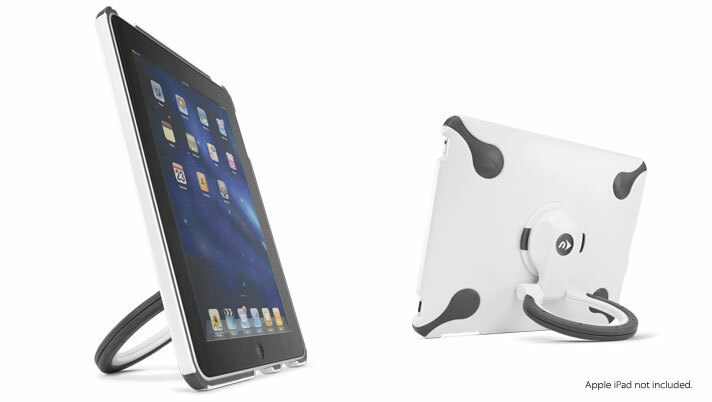 The desktop stand also doubles as a highly effective one hand grip so you can use your iPad while standing or walking. 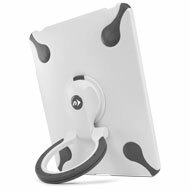 And to take presentations to the next level, the NuGuard GripStand handle can even be rotated to use as a hook to hang your iPad on the wall in either landscape or portrait orientation. Going mobile with your iPad is a breeze too. During transport, flip the iPad around so the glass is facing into the protective case for extra protection. Use the desktop stand as a handle to carry your iPad like a briefcase. Or, when travel bag space is a consideration, just twist the desktop stand to remove it. 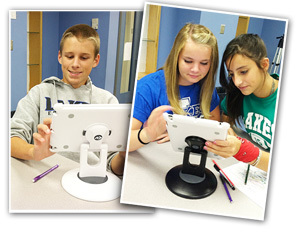 Note: GripStand must be used with an undamaged iPad for the device to fully seat properly inside the GripStand. When installed correctly, the iPad screen should not touch a table surface when laid face down. The NewerTech GripStand and GripBase have been a lifesaver and stress reducer in my 21st century classroom. We spent precious funds to purchase 15 Apple iPad 2's for use by 240 students each day. Protecting the iPads during use is a top priority. The GripStand and GripBase have definitely prevented accidental damage of the iPads. The cases are durable and easy to label. They securely hold and protect the iPad from occasional "rough use". The GripBase is my favorite aspect! It is heavy and reliable, and they have worked flawlessly during eight weeks of use so far. 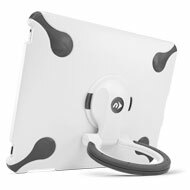 They make it easy for students to collaborate and create as the bottom of the base swivels AND the screen can flip and turn from where the base attaches to the iPad. I no longer have to worry about iPads sliding off the table. This is an amazing product and we are very thankful for the confidence it gives us in ensuring the safety of our technology investment. Absolutely amazing...The most clever way to carry, display, and use your iPad"
"Nice modular design...nice solid feel...good shock absorption. A great table stand...I'm using this for my podcast." Rating: 4/5 I Rally Like This Holder, But.... March 30, 2017 I really like this holder, but you can not use as a carrier - won't snap into place when pacing screen side down. If it wasn't for this I would rate 5 star. Rating: 5/5 Lightweight, & easily detached for camera/video use April 7, 2014 I have bought 9 of these, for myself, and my family, as gifts, for iPads 2, 3 and mini. The GripStand allows camera and video use, by interchanging the Display stand mechanism with a similar hand grip stand lock. The Protective case remains in place, keeping the tablet safe. The Apple Smart cover fits perfectly with the case. I have had people approach me at the Apple Store, and at a Book Fair, where I use these, asking me where to get one. My biggest regret, is that one is not available for my newest iPad Air 5-G model. I hope that will change soon.